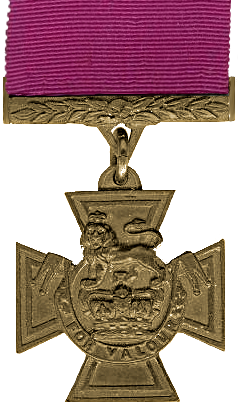 “Most conspicuous bravery, or some daring or pre-eminent act of valour or self-sacrifice, or extreme devotion to duty in the presence of the enemy.” This is a brief description of the merits for which military personnel can receive the Victoria Cross (VC)—the most prestigious and highest award in the British system of military distinction. During the years of World War II, 181 soldiers received this award. One of them was Major Robert Henry Cain, the first and so far only inhabitant of the Isle of Man to receive the VC. During the battle of Arnhem, Cain showed extraordinary courage and, despite being badly wounded, destroyed several enemy tanks and self-propelled weapons. Cain was born in the Chinese city of Shanghai on January 2, 1909 into a family of Isle of Man natives. In early childhood, he and his parents returned to the island, where he grew up and was educated at the King William’s College. In 1928, Cain was enrolled in the Honorary Artillery Company of the British Territorial Army, a volunteer reserve of the armed forces, and in February 1931 he was placed on the reserve list. In April 1940, Cain was called up to serve with the Royal Northumberland Fusiliers as a second lieutenant. In 1942 he was sent to the 2nd Battalion of the South Staffordshire Regiment, which was part of the 1st Airlanding Brigade under overall command of the 1st Airborne Division. 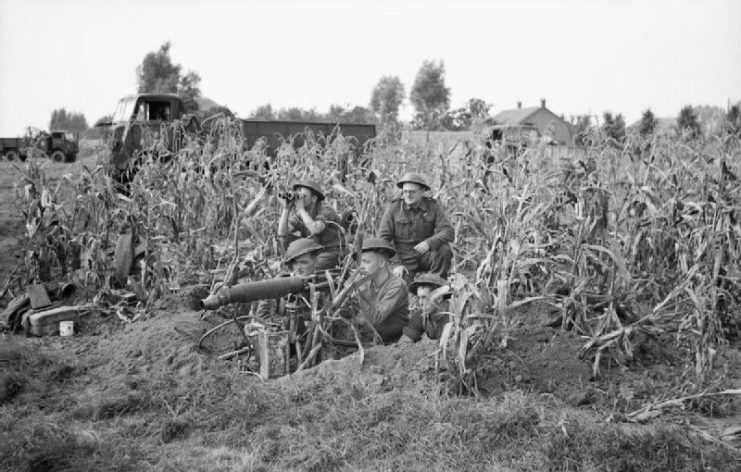 A Vickers machine-gun team of 7th Royal Northumberland Fusiliers, 59th (Staffordshire) Division in position in a field of corn. 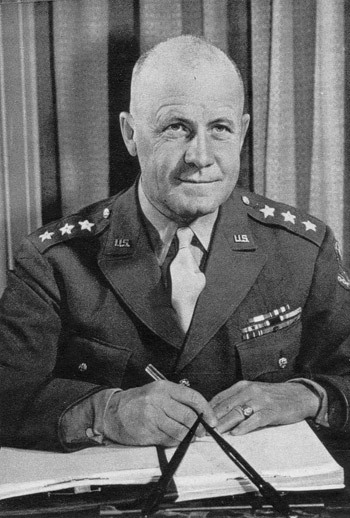 In April 1943, Cain was temporarily promoted to major. He served in that capacity but would not be fully granted the rank until 1945. 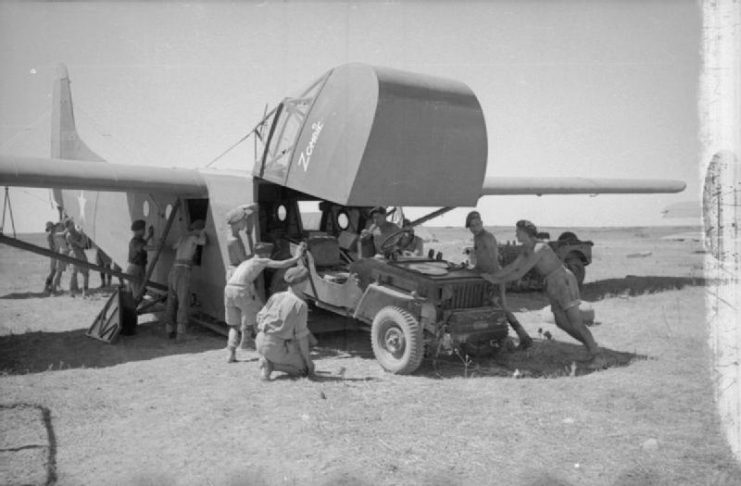 The 1st Airlanding Brigade took part in an operation to land allied troops in Sicily on the night of 9-10 July 1943 as part of Operation Ladbroke. In the same month, Cain took command of Company B of the 2nd Battalion. In September 1944, Cain took part in operation Market Garden, in which British forces landed in the area of Arnhem with the objective of capturing bridges across the Rhine River. 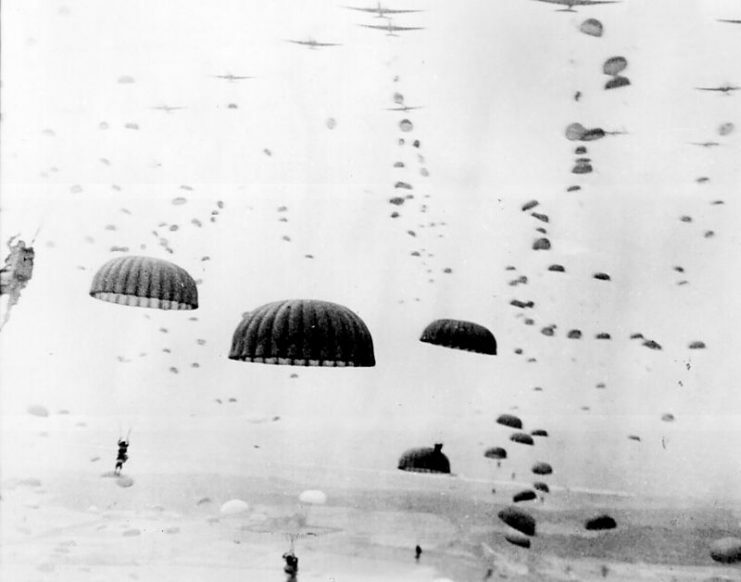 According to the plan, the first wave of paratroopers was to land on September 17. 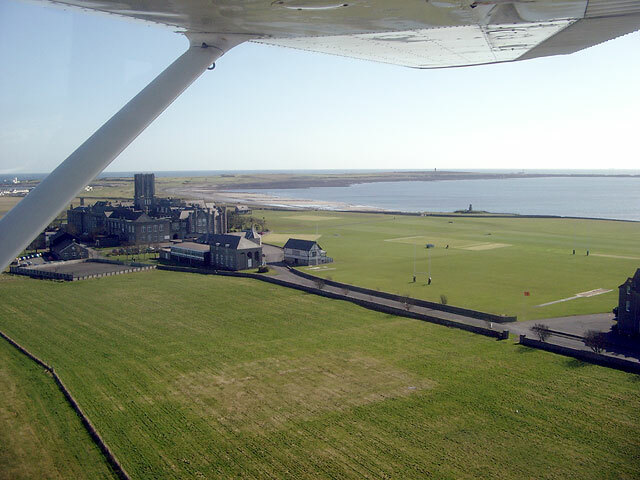 However, shortly after take-off from the Royal Air Force’s Manston airbase, the Airspeed Horsa glider in which Cain was located broke away from its towing cable. No one was hurt in the descent, but Cain’s unit had their participation in Market Garden postponed until the next day. On September 18, Cain was successfully shipped to the Arnhem area. However, by this time the situation in this region for the British was very complicated. Only a small division under Lieutenant-Colonel John Frost managed to consolidate its position near the bridge in Arnhem, but was now cut off from the main forces. On September 19, 1944, at 4:30 AM, the Staffordshire forces together with other units launched an offensive towards the Arnhem bridge with the goal of reinforcing Frost. At the head of the 2nd Battalion column was Company D, with companies A and B behind it, while Company C remained in reserve. 17 Sep 1944. 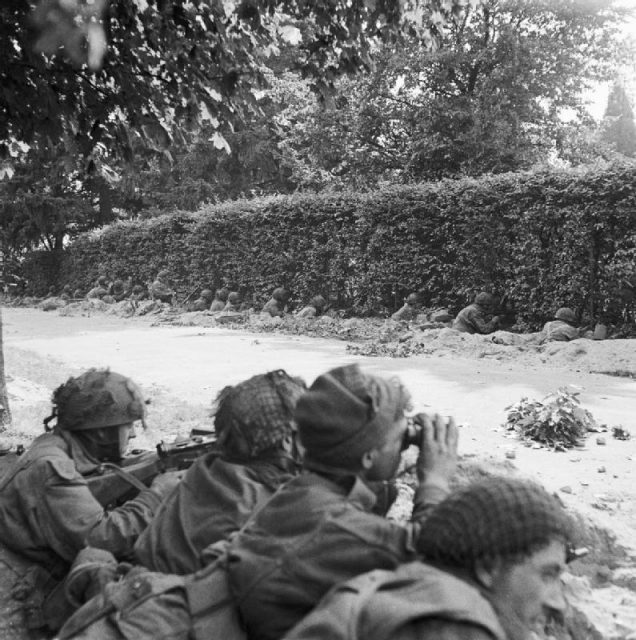 Men of C Company 1st Battalion, Border Regiment, waiting in ditches beside the road, ready to repulse an attack by the enemy who were barely 100 yards away. In the area of the St. Elizabeth Hospital, during the clearing of the houses, the leading company met with fierce German resistance. Then company B led the way forward and reached a hollow located near the city museum of Arnhem. At this point, Cain and his men first encountered enemy armored vehicles. Despite the fact that company B was armed only with man-portable PIAT (Projector, Infantry, Anti-Tank) weapons and mortars, they bravely engaged the enemy tanks and self-propelled artillery mounts. However, they were unable to disable the vehicles. By 11:30 they had run out of ammunition and the situation was hopeless. 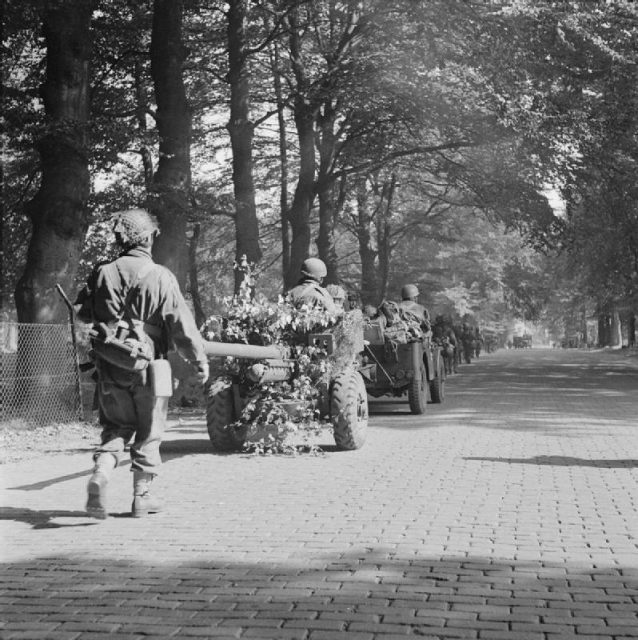 Men of the 2nd Battalion, South Staffordshire Regiment advance toward Arnhem, towing a 6 pounder Anti–Tank gun, 18 September. Lieutenant Colonel McCardie, commander of the 2nd Battalion of the South Staffordshire Regiment, ordered a retreat. Cain and several of his men were able to escape, but most of the British soldiers in the area were captured. The surviving soldiers returned to the position of the 11th Parachute Battalion, which had been held in reserve. Upon meeting the A company commander, Major Gilchrist, Cain declared, “The tanks are coming, give me a PIAT.” Gilchrist did not fulfill his request and ordered the soldiers to regroup behind the 11th Battalion. 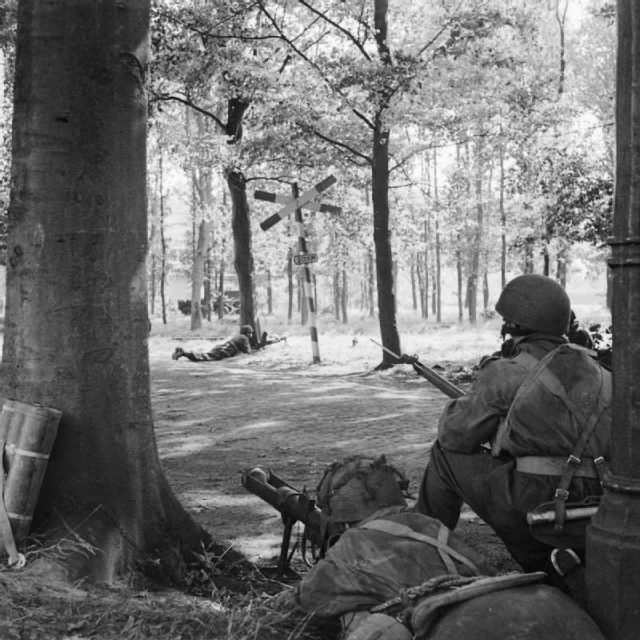 Men of HQ Troop of 1st Airlanding Brigade Reconnaissance Squadron at Wolfheze on the outskirts of Arnhem, 18 September 1944. 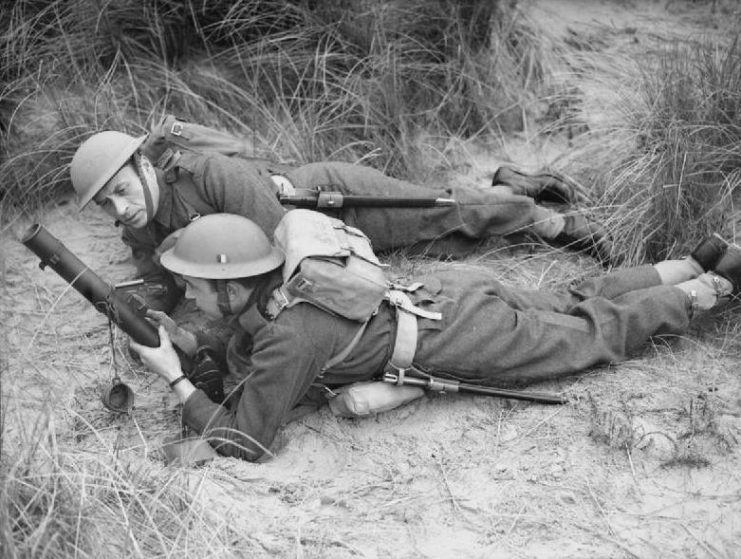 The man on the left is manning a PIAT. They formed into five separate platoons with about 100 people commanded by Major Cain. The commander of the 11th battalion, Lieutenant Colonel George Lee, ordered Cain to lead a bayonet attack to capture a wooded height called Den Brink and gain a foothold on it to facilitate further fighting. At about 12:30 pm the attack began, and was initially successful. However, the terrain conditions did not allow the British to gain a foothold on the hill. The soil was hard and full of tree roots, so the soldiers could not dig in, and represented an easy target for the enemy. Cain understood that to remain on the hill was tantamount to suicide, and he ordered the soldiers to withdraw back to Oosterbeek. At Oosterbeek a defensive perimeter was formed and led by Lieutenant Colonel Thompson, the commanding officer of the 1st Airlanding Light Artillery Regiment. Thompson ordered Cain to place his soldiers in front of artillery batteries in anticipation of a German counterattack. 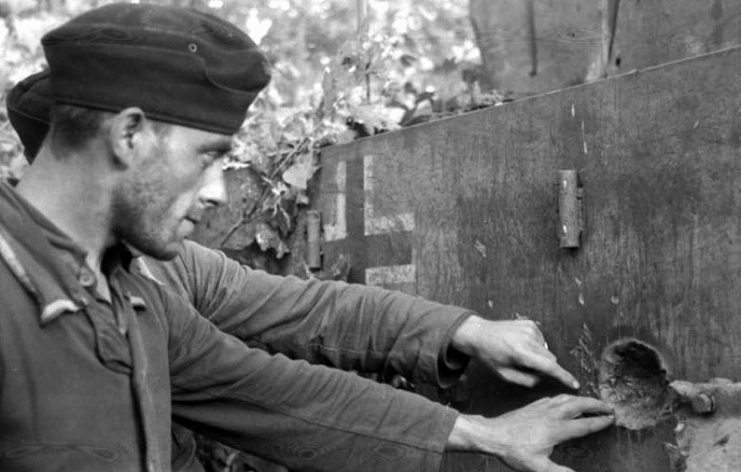 On September 20, German troops launched an offensive to break through the paratroopers’ defenses. Throughout the day, the British fought off the enemy attacks. Then, together with other units under the command of Major Richard Lonsdale, who took command after Thompson was wounded, they retreated to the main divisional perimeter of the defense. 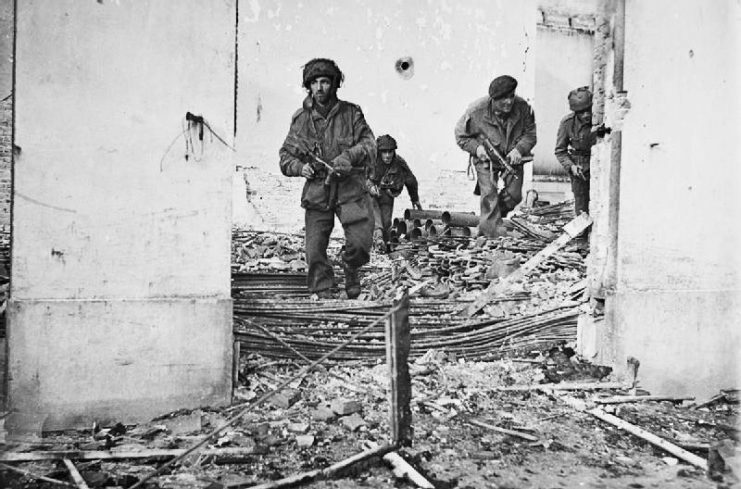 Four British paratroopers moving through a shell-damaged house in Oosterbeek to which they had retreated after being driven out of Arnhem. During the entire period of defense, Cain showed heroism and was filled with the desire to destroy as many enemy vehicles as possible. On the afternoon of September 21, his position was attacked by two tanks. Directed by a soldier who had taken refuge in the building above him, Cain was in a trench and waited while a StuG III self-propelled gun approached closer. Suddenly, the StuG fired into the building, killing the British who were hiding there and showering Cain with masonry. However, this did not stop Cain, and among the clouds of smoke and dust, he fired his PIAT until he disabled the StuG. Its crew attempted to escape, but was immediately shot by the British. Cain then began firing at the second tank. Suddenly, an armor-piercing grenade exploded inside his PIAT, and the major was thrown backwards. Temporarily losing his sight, he continued to yell orders to his soldiers. In the end, the second German tank was also destroyed. 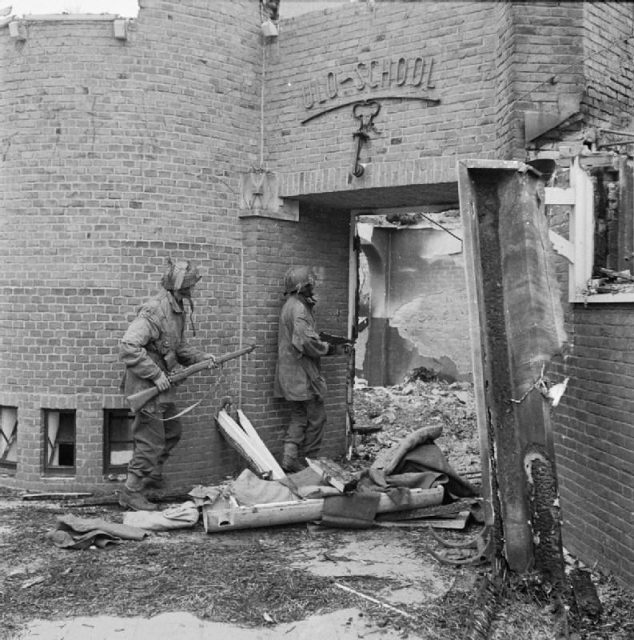 A Dutch school damaged by mortar fire, being searched for German snipers by Sergeant J. Whawell and Sergeant J. Turrell of the Glider Pilot Regiment. Witnesses thought Cain was out of action, but after half an hour his sight returned to him. He refused morphine and, ignoring the advice of the orderlies, returned to his position. During the next day, Cain destroyed three units of German armored vehicles. However, from the constant noise and explosions of his eardrums burst. Once again, injuries did not stop Cain. He stopped the bleeding with bandages stuffed in his ears and continued the battle. On September 24 a Panzer VI Tiger tank invaded Cain’s position. 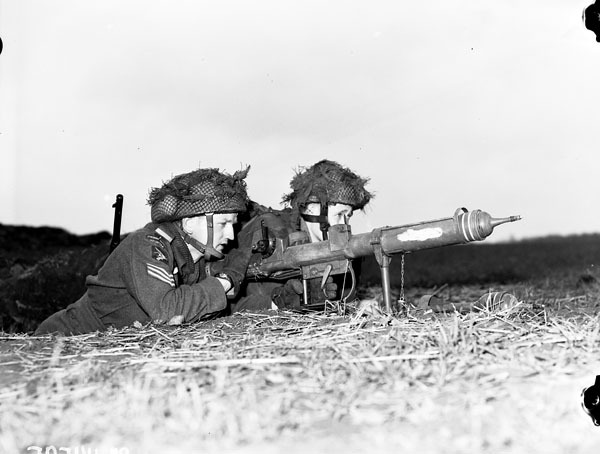 With the help of a soldier from the Royal Artillery Regiment, he used a 6 pounder anti-tank gun to destroy it. Unfortunately, the gun’s recoil mechanism broke down and it became useless for further action. The next day, the British had no usable PIATs left. 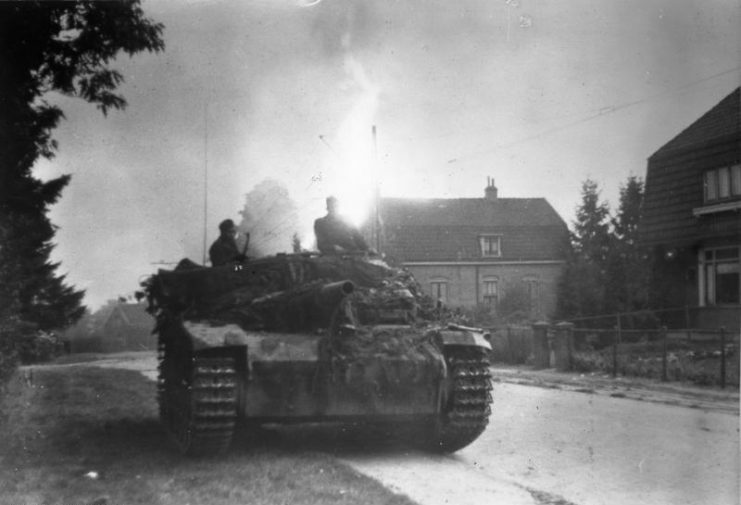 The Germans, with superior forces supported by flame throwing tanks and artillery units, attacked their positions. Cain used a two-inch mortar to open fire on the enemy, thereby inspiring his soldiers to resist stubbornly. German troops retreated, and on the night of September 25-26, the British began evacuating. Beforehand, Cain found the time to shave off the week’s growth of beard from his face. Brigadier ‘Pip’ Hicks noticed and commented “there’s one officer, at least, who’s shaved,” to which Cain replied, “I was well brought up, sir.” After making sure that all the soldiers had successfully retreated from the Rhine, he was the last to cross over in an old boat. The British command reported that Cain had destroyed or disabled six tanks, four of which were Tigers, as well as several self-propelled guns. 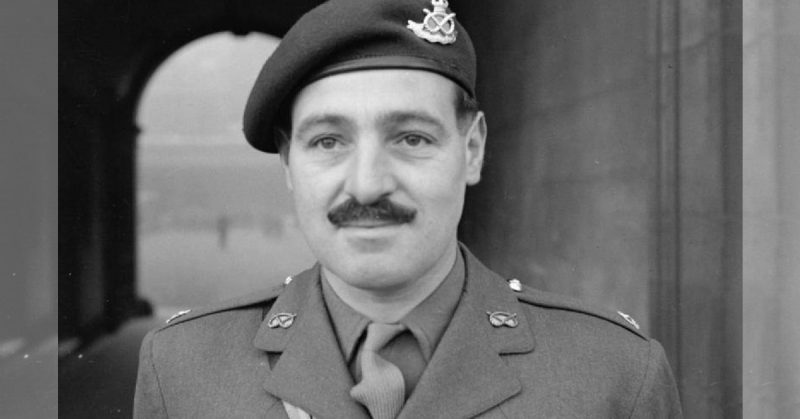 For his heroism, cool-headed command and disregard for his own safety, Major Robert Henry Cain was awarded the Victoria Cross in December 1944, becoming the first and only native of the Isle of Man to receive this award. After the surrender of Germany, Cain took part in Operation Doomsday, in which the British 1st Airborne Division was deployed to Norway and accepted the surrender of the German troops there. On December 28, 1945, he was discharged into the reserves with the official assignment of the rank of Major. 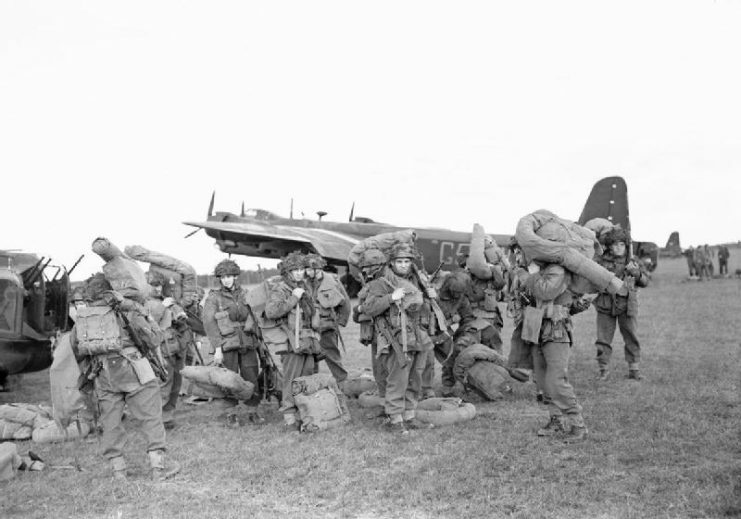 British airborne troops just disembarked from Stirling aircraft at Gardermoen airfield near Oslo. After leaving the army, he returned to his previous job at the Royal Dutch Shell company and lived in East Asia and West Africa. In 1951, while working in Nigeria, Kane was elected to the Nigerian House of Representatives. In 1965, he returned to the Isle of Man, where he lived to death from cancer in 1974. 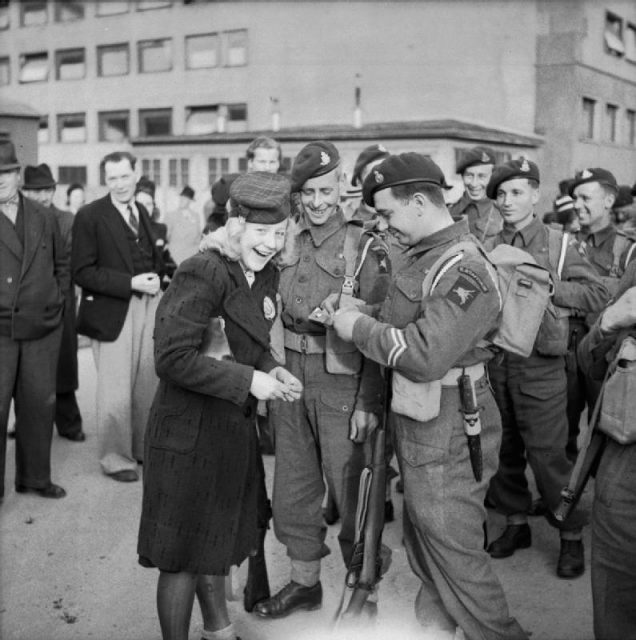 Troops of 1st Airborne Division are welcomed into Oslo by Norwegian civilians, 13 May 1945. His daughter Frances Catherine Cain married Jeremy Clarkson, a famous British TV host and journalist, 1993. In 2003, Clarkson made a documentary about Kane’s exploits, as well as others who received the Victoria Cross, entitled The Victoria Cross: For Valour.